I had high hopes for Murder in Piccadilly, a book that combines two of my favorite things: a mystery and a London setting. This book was originally published in 1936, and has been re-issued as part of the British Library Crime Classics series. Unfortunately, to my mind, the book doesn't hold up very well for the modern reader. The story is a somewhat familiar one. Bobbie Cheldon is a young man who lives with is widowed mother in somewhat shabby circumstances in Fulham. The one bright spot in their drab existence is Bobbie's prospects: he is the heir to the estate at Broadbridge Manor. When he takes over the estate, he'll have an income of £10,000 per year (as we are informed over and over again). This was apparently quite the fortune in 1936! Unfortunately, Uncle Massy Cheldon, who at 50ish seems quite ancient to young Bobbie, shows no inclination of helping things along with a natural death any time soon. Bobbie has fallen madly in love with a lower-class but lovely dancer at the Frozen Fang nightclub named Nancy Curzon. Nancy is willing to marry him, but not if it involves living in poverty. She has been told that an American tour showcasing the dancing talents of her and her partner Billy Bright is in the works, but she and Billy would have to be married first (somewhat antiquated morality!). Bobbie is naturally becoming desperate at the thought of losing Nancy. A somewhat shady acquaintance of Nancy's, ex-boxer Nosey Ruslin, hears of poor Bobbie's predicament. Nosey insinuates himself into Bobbie's life, seemingly befriending the younger man and offering to help him out financially from time to time as necessary. The dim and naive Bobbie takes Nosey at his word (naturally). Nosey and Billy, meanwhile, are plotting ways to get rid of Uncle Massy and, once Bobbie has the impressive yearly income, help themselves to a large portion of it. Bobbie is rather wishy-washy, but willing to do anything to keep Nancy. 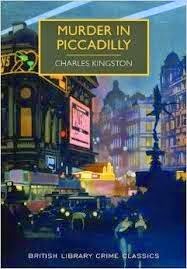 It's therefore no surprise to the reader when the titular Murder in Piccadilly occurs (in Piccadilly Underground station, in full view of hundreds of witnesses) and Uncle Massy is no more. Enter Chief Inspector Wake of Scotland Yard. He has a pretty good idea of who was behind the murder, but with no many witnesses all claiming not to have seen anything, he's going to have a hard time proving anything. In fact, his complete assurance of who was behind the murder (and who had absolutely no knowledge of it beforehand) seems to have come out of nowhere. His discussions with his second in command, Detective-Sergeant Clarke, go over and over the suspects and why they are or are not involved, but never seem to have much evidence backing them up. The action in the story is extremely slow, and the characters seem to have the same discussions over and over again. There is a final "twist" that is, I assume, meant to confound the reader, but I thought the overall resolution was rather weak. Also, some of the language will be rather startling to modern ears -- particularly the ethnic slurs that are thrown around rather casually. I know that we are supposedly dealing with lower-class and uncouth individuals (those in Nancy's circle, anyway), but it's still rather jarring to read. Sadly, even a London setting couldn't save this story!